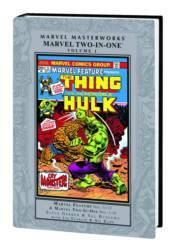 Two hundred volumes long and still going strong, the MARVEL MASTERWORKS celebrate Vol. 200 with the launch of Marvel Two-In-One! Yes, the ever lovin', blue-eyed Thing's own series collected is between hard covers at last! Begun as a MARVEL FEATURE tryout, Ben Grimm's headlining effort kicked off with Hulk and Iron Man battles (not to mention Thanos and the Blood Brothers), and then shifted into high gear with monster vs. monster - yup, it's Thing vs. Man-Thing! Rounding out the first ten issues are the revival of the Guardians of the Galaxy; revelations in the life of the Valkyrie; and adventures with Daredevil, Sub-Mariner, Ghost Rider, Thor and Black Widow - and before you know it, you'll be clamoring for more! Ya ain't a Yancy Streeter, are ya? Collecting MARVEL FEATURE (1971) #11-12 and MARVEL TWO-IN-ONE (1974) #1-10.